Buy Crab Apple Tree (Malus sylvestris) online from UK tree supplier of cell grown broadleaf hedges and shrubs. An attractive, native British Tree, the Crab Apple Tree (Malus sylvestris) is an important tree of native woodland and hedgerows. Other trees usually found in Country side hedges include: Hawthorn , Blackthorn, Hazel , Dog Rose and Elder. 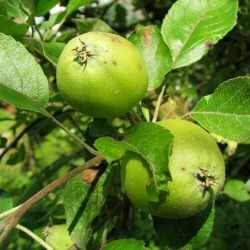 This tree also forms the basis of most apple fruit tree varieties, The crab apples, themselves are sour tasting, although edible. Ideal for wine making and crab apple jellies. In addition, the wood is used in turnery and inlay work and what is more the wood makes an excellent firewood. Ideal for providing a self-sufficient supply of firewood. Typically, Crab Apple is planted in groups of between 10 and 25 trees. This number of trees is ideal for creating a wildlife habitat and a meaningful source of food and shelter. Spacing may vary between 1m (3ft 4in) and 5m (16ft 8in). The aim is to mimic what nature intended and thus avoid artificial lines. Blending of one species into another is suggested although bearing in mind different growth rates. Crab apple is a key native tree species and along with the many other native, British tree and shrub species we sell will form part of an attractive native woodland. See What Our Customers Are Saying About Our Malus Sylvestric Crab Apples. No one has written a review about these yet because we have not had time to chase them....but we will!